This article has been updated with more information shared by the 2D Bubble Tea team. 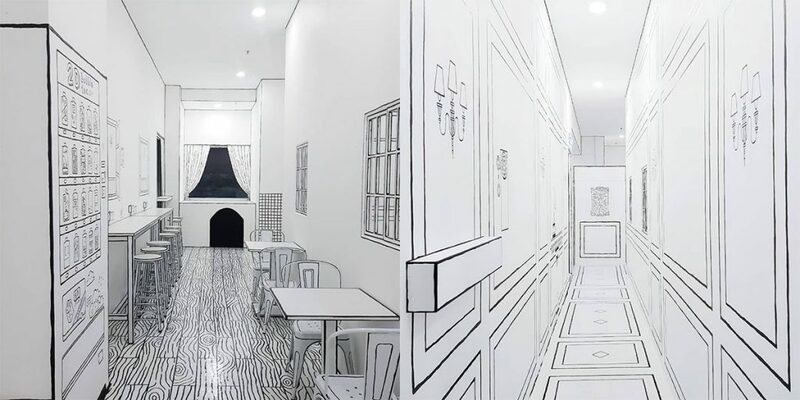 Chances are that you’ve seen pictures of the 2D cafe circulating around the web, or even read about it. 2D Bubble Tea is the latest eatery to achieve viral status in KL and undoubtedly, the cafe is unique. And the way the concept came along is a pretty interesting one too. Mr. C, one of the masterminds behind 2D Bubble Tea, noticed how he had a talented waiter named Yuu, who worked at 2D Bubble Tea’s sister cafe, La Fleur (yup, that viral unicorn cafe)! 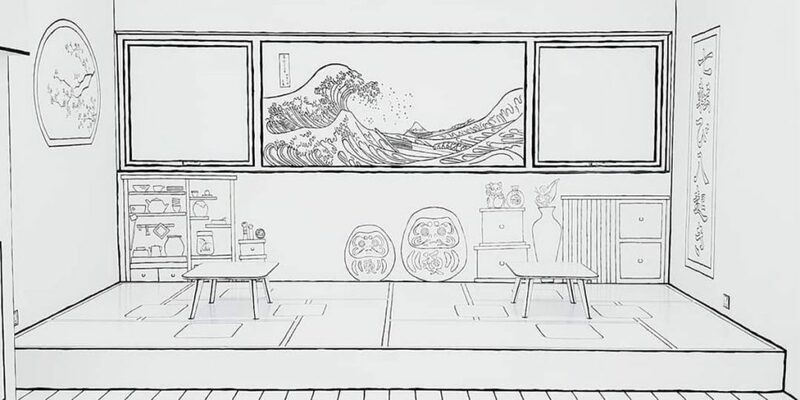 Noting how she was gifted in art, the team (comprising of Mr. C, shareholders, Ong and Tania and investor JJ) engaged Yuu for the concept of their 2D cafe. It took Yuu (and assistant Carmen) only 1.5 months to hand paint everything in 2D Bubble Tea and she did all this while still waitressing at La Fleur. Today, she joins the ranks of being one of 2D Bubble Tea’s shareholders. 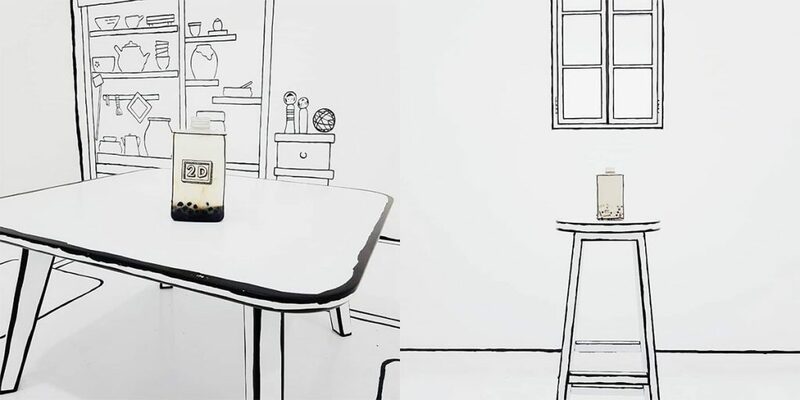 At 2D Bubble Tea, every single furniture is hand painted and the team imported pure white furniture as their base to paint on. Interestingly, the quickest project to complete was the furniture. It was the walls, floor and ceiling that took a longer amount of time. This was due to the fact that a special material was required to paint it. 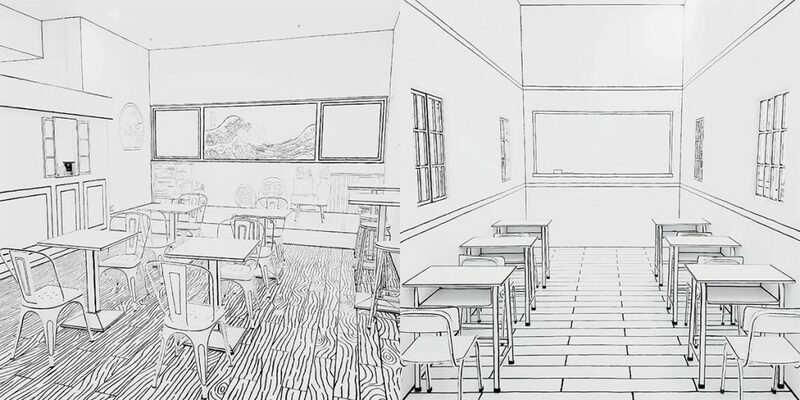 Additionally, the wall required pencil sketches prior to painting and the team also needed to erase the pencil marks after they were done. Mr C. shared with DiscoverKL that the team was initially nervous to begin on this project. As he puts it, “If the effect is not there, it’s game over and it’s quite a big risk”. “When the lines are too straight, it doesn’t look real. So I purposely asked Yuu to make it look a little senget,” Mr. C joked. But this actually helped them achieve the comic book effect that they were going for. 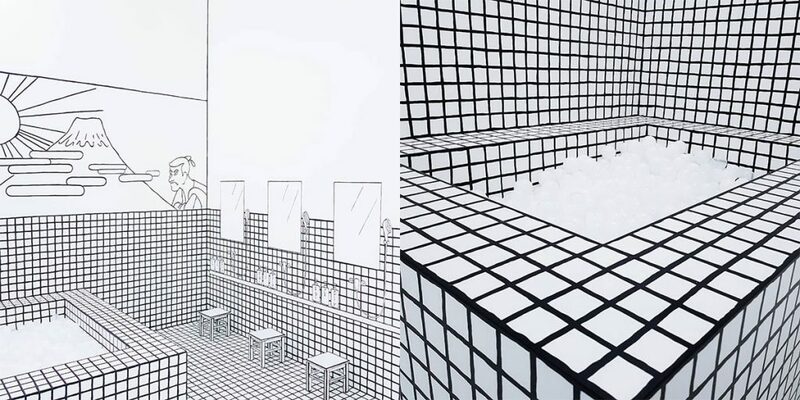 On top of that, 2D Bubble Tea has a Japanese-Western theme, with tatami seatings and an “onsen” which is really a bathtub ballpit filled with white balls to simulate “foam”. This is what distinguishes the black-and-white bubble tea space from existing cafes of that nature, considering how this is not a new concept and is already a booming business in Korea and Taiwan. 2D Bubble Tea currently offer 5 flavours of bubble tea (one of which is currently sold out) but the team is constantly looking to update their existing flavours. “Every single bottle? We make the bubble tea fresh on the spot,” Mr. C shared. The bottles, which also has a 2D effect, were designed by Mr. C and Tania and were painted by Yuu. Besides bubble tea, they also serve bento, croissants, sandwiches, chips and other light food. Basically, food which pairs well with bubble tea. Speaking about the viral concept that they came up with, Mr. C noted that social media is everything and now is the best time to engineer a space where people would come to snap pictures at and hang out. The team would understand this very well, having been accustomed to viral concepts like unicorn cafe, La Fleur. 2D Bubble Tea is currently in their first week of launching but is already setting their eyes on 2 upcoming outlets in SS15 and JB. 2D Bubble Tea is located on the third floor of Sunway Geo Avenue. And if you’re a fan of viral cafes, make a stop at La Fleur, which is located on the first floor of the same mall.